I’m David - the guy behind the camera. I love a good proper coffee, and have a slight obsession with Star Wars. I have three beautiful children and an awesome wife who are the centre of my world and my inspiration. I rarely leave home without my camera. I love what I do. It is an incredible honour to be asked to photograph a wedding - one of the happiest days that we all love to be a part of. I get to do this all the time, at some of the most beautiful wedding locations in Scotland. My approach to wedding photography is natural and honest - to capture the visual story of your day candidly and with fun, anticipating those precious moments and documenting them forever in print. I won’t take you away from your guests for hours, and I promise to avoid awkward posing at all costs! Instead, I like to get on with unobtrusively photographing all the little details. Photography, above all else, is about people. It's about the interactions between people, and the fleeting, perfect moments which decorate our lives. I want you to look back at your photos and remember how you felt, not how you were told to pose. This is how I go about photographing a wedding, with each photo part of a bigger story that you’ll want to relive many years from now. "David was absolutely fantastic and professional and so helpful throughout the whole day. 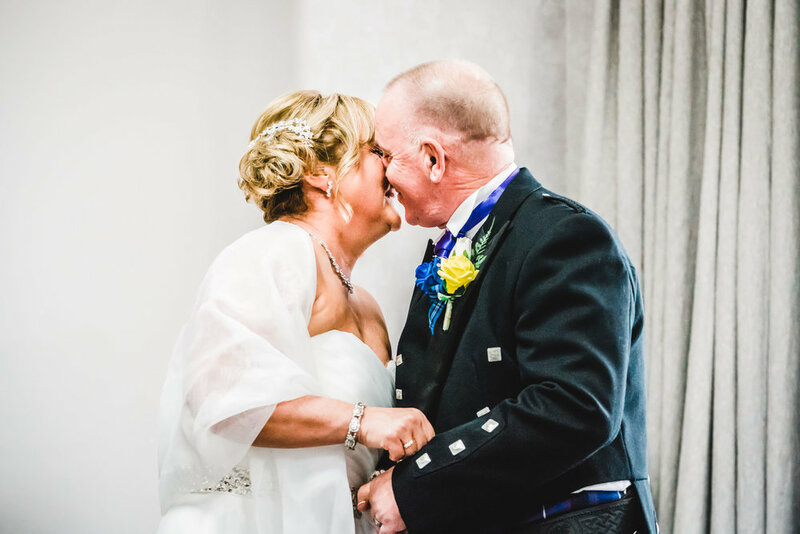 I would highly recommend him and can't thank him enough for capturing the special moments on our day." David was fantastic at our wedding! He was professional and put us completely at ease (even in my moment of anxious nerves just before the ceremony!). Our guests all commented on how lovely he was and always up for a laugh (we don’t take ourselves too seriously!) We definitely can’t recommend him enough! "We were blown away by the quality of the pictures David achieved for us. His documentary style photography captured our evening just perfectly. Choose Dearly Photography and you won't be disappointed!"